How does article approval work? Users with the Author role can create new articles and submit them for approval. Users with the Article Approver role can review articles waiting for approval, and choose to approve or decline the article. Create a new article as normal. Instead of a 'submit' button, you should instead see options to Submit for Approval, or Save your article. If you choose to save your article, the approval process will not be started. The article will stay as a draft in your account, and you can return to it at any time to edit it or submit it for approval. If you choose to submit your article for approval, the approval process will be started. It will be sent to article approvers for review. Approvers may approve or decline the publication of your article, or may send the article back to you for changes. 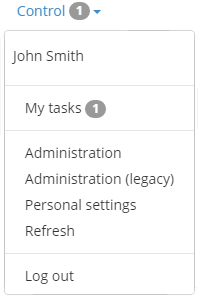 If your article is sent back, it will appear in your tasks list. See the section below titled 'Viewing your tasks' for details on how to list and interact with tasks. You can change the content of your article by clicking Visit page, then clicking the pencil icon and editing the article content. 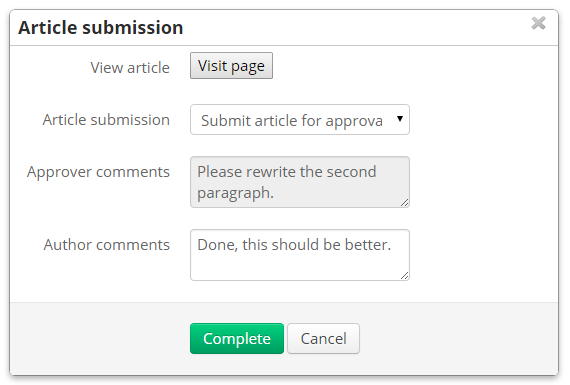 Once you've made changes, you can either submit the article for approval again, or delete the article. Articles waiting for approval will appear in the pool task list for everyone with the Article Approver role. See the section below titled 'Viewing your tasks' for details on how to list and interact with tasks. When an approver clicks the Process button, the approval task is temporarily assigned to that approver and is removed from the queue. This helps to make sure more than one approver doesn't try to review the same article at the same time. You can review the article by clicking the Visit Page button. 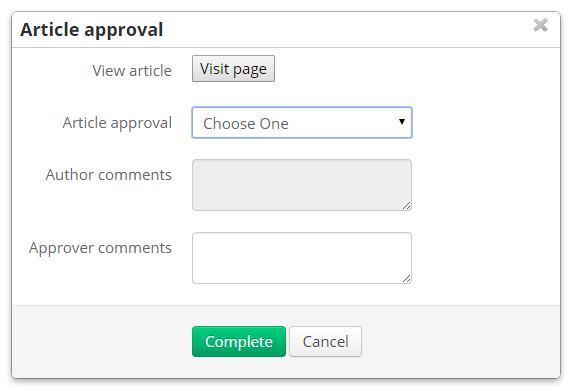 If you would like to approve the article, select 'approve article' from the Article approval dropdown list, then click Complete. The article will be published immediately. If you would like to decline the article, select 'decline article' from the Article approval dropdown list, then click Complete. The article will be deleted. Declining an article is final, it cannot be undone. If you would like to send the article back to the author for changes, select 'request changes by author' from the Article approval dropdown list. You can enter comments (optional) in the Approver comments section, which will be sent to the author to read. When you're ready, click Complete. If an article that was returned to the author is resubmitted, it will appear in your tasks list again, and may include comments from the author. Repeat steps 1-6 until the article is either approved or declined. Assigned tasks are tasks that are assigned specifically to you. Only you can act on assigned tasks. Pool tasks are tasks in a queue that you have the necessary permissions to work on. Pool tasks can be seen by everyone on the site with the correct permissions. The first person to process a pool task will have the task assigned to them. Depending on site settings, if you begin to process a pool task but then cancel, the task will usually be returned to the pool and another person with the correct permissions may pick it up. You can click View requester details to view basic information about the person who initiated the task. For article approvals, this is the original author. To start processing a task, click the Process button.